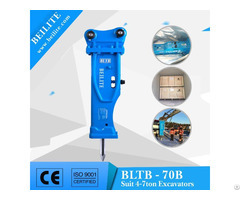 Excavator List for BLTB140 hydraulic rock hammer type for hydraulic excavator. 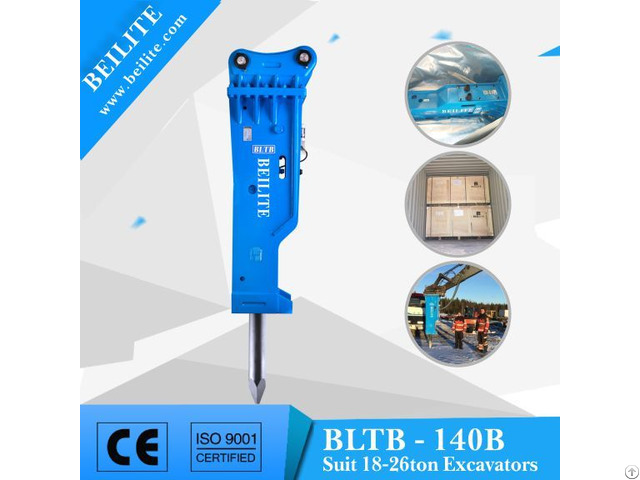 Advantage for BLTB140 BOX type hydraulic hammer breaker . T/T payment at sight---30% of payment in advance, 70% of payment before shipment. Each hydraulic breaker will be wrapped with protective wraps and then packed with wooden boxes. Founded in 2003, BEILITE Machinery Co., Ltd. has the floor area of 15, 000 square meters, the Company has good foundations in terms of technology, management and equipment, and standard enterprise running; at present, the Company is possessed of Germany, Japanese, and other imported high-end production devices and precision detectors. The Company is footed in the construction machinery industry, focused on the research & development, production and service of the hydraulic breaking hammer, and is the famous professional enterprise in the industry. BEILITE advocates the core idea “cultivating person by credibility, establishing business by innovation, and occupying market by its brand”. In the market, blue BLTB product is widely applied to every project field, the blue represents broad as well as stability and trust, we cherish customer’s trust for we are focused on product quality. We are responsible for providing high-quality product and service, and creating the maximum value for customers. Environment improvement and social contribution are always our philosophy for public benefit. We are not only devoted to improve environment but also actively participate in the social service and feedback the society. We also pay attention to every BEILITE worker, concern their demand, abide by the rules of honesty and fair to commonly return to the society.